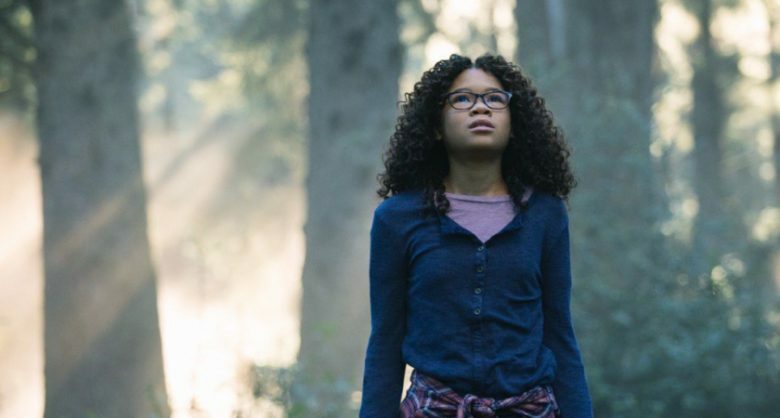 A Wrinkle in Time is an exercise in style over substance. The production is pretty good, there are some cool visuals and the story (adapted from the beloved 1962 novel by Madeleine L’Engle) definitely has potential. But the movie is slow and muddled. Worst of all, it just is not that fun to watch. Director Ava DuVernay has the pieces, but she somehow did not assemble them in the most effective way. Meg (Storm Reid) is a depressed girl. She used to be a happy, brilliant student until her scientist father (Chris Pine, Captain Kirk in the ongoing Star Trek films, who is descended from Russian Jews on his mother’s father’s side, but is not religious) disappeared four years earlier. Now she struggles through every day, much to the consternation of her mother (Gugu Mbatha-Raw). One day, her adopted little brother, Charles Wallace (Deric McCabe), invites an odd woman into their house. She is Mrs. Whatsit (Reese Witherspoon) and she seems to have some idea of how to find their father. Soon, Meg, Charles Wallace and Meg’s new friend Calvin (Levi Miller) are whisked away by Mrs. Whatsit, Mrs. Who (Mindy Kaling) and Mrs. Which (Oprah Winfrey) on a quest through the universe to bring back Mr. Murry. Somehow none of this comes off nearly as exciting as it sounds. There is a lot going on, but not much of it connects. There is a lot of talent on the screen (also including comedian Zach Galifianakis as the Happy Medium and Michael Peña as the mysterious Red). However, the characters and story are overwhelmed by the size of it all. It is a huge production when perhaps a smaller one would have been more fitting for the material. More care seems to have been taken with the look of the film than in making sure the story comes off in a clear and impactful way. DuVernay tries to stretch the material to epic status and it just does not work. That being said, A Wrinkle in Time is a visually impressive film. Meg and her friends are taken to some pretty interesting places and their journey through space yields some really cool sights. But that is all they are. The costumes, a character that turns into a large, green, leaf creature, moving flowers that talk and a planet that is constantly changing itself. They all look good when they first come on screen. Unfortunately, that is all they really do because DuVernay does not utilize them in a way that enhances her film. After a while, I became numb to them. They are the film and that can only carry things so far. The biggest problem I had with A Wrinkle in Time is that it never becomes the fun, escapist, fantasy adventure it seems like it was intended to be. It is most definitely not bad but, for a film where many amazing things happen, it is seriously lacking in magic. It is kind of slow and never develops the wonder that its trailers hinted at. That is a shame because those made the film seem like a lot of fun. Instead, we ended up with a movie that looks like a lot of effort was put into it, but does not have much life. It is like everyone went through the motions on this project except for the visual effects artists, who did a heck of a job. Read Ben’s last movie review on Death Wish.